A ScarbsF1 follower in the Melbourne pit lane sent me these exclusive pics. We can see the Ferrari stripped in the garage. There’s a huge amount of detail to take, but the key things are the exhaust routing for the EBD, the rear suspension and Rear Wing mechanism. The exhaust loops forwards before turning back on itself to route towards the diffuser. This set up is used as it keep the exhaust well forwards within the sidepod, which helps to keep the sidepods tight and slim. We cant see the final section of floor, this might need to be removed in order to take the floor off. Ferrari retained the pushrod rear suspension set up for the F150. To keep it competitive in aero packaging in comparison to the recently favoured pullrod, they have pushed the entire rocker and damper assembly to the front of the gearbox. In doing so they have placed the rockers nearly flat with their pivots pointing down. This keeps the assembly in the aerodynamic shadow of the engine and airbox, so effectively they don’t add any volume to the rear ends aerodynamics. Lastly the “Drag Reduction System” mechanism can be seen sticking out of the gearbox. This is a hydraulic system and needs to be powerful in order to move the rear wing flap at quickly at speed. As both the flap will be heavily loaded by airflow and designers want the switch from closed to open to be in a matter of milliseconds. This year the technical talk has largely been about exhausts. How teams have adapted to the ban on double diffusers and the added restriction on Exhaust blown diffusers. Just to aid understanding going into the new season, I have explained how these solutions work and how they look from beneath. Since 2009 the regulations regarding the floor have been interpreted in a literal sense to allow the double deck diffuser (DDD). Indeed the very same rules were exploited to a lesser extent under the previous rules, but this only produced small extra channels in between the outer and middle diffuser tunnels. With the major cut in aerodynamic aids for 2009, several teams sought to find a way to gain more expansion ratio from the smaller diffusers. In essence the loophole exploited the definition of surfaces formed between the step and reference planes. Multiple surfaces allowed fully enclosed holes, which fed the upper diffuser deck that sat above the 175mm lower diffuser. This allowed diffuser to be significantly larger in order to create more downforce. Notably Brawn, Williams and Toyota launched 2009 cars with DDDs. Other teams soon followed suit in 2009 and last year every car exploited the same loophole. 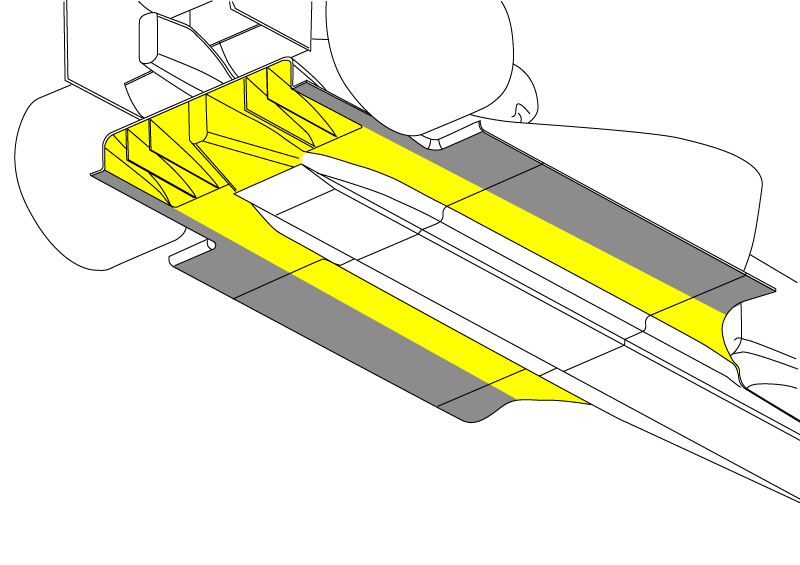 Over the winter the FIA acted to close the loophole, by enforcing a single continuous surface across a 90cm span under the floor. In a stroke this banned the double diffuser, there being no scope to create any openings in the floor to feed the upper deck. 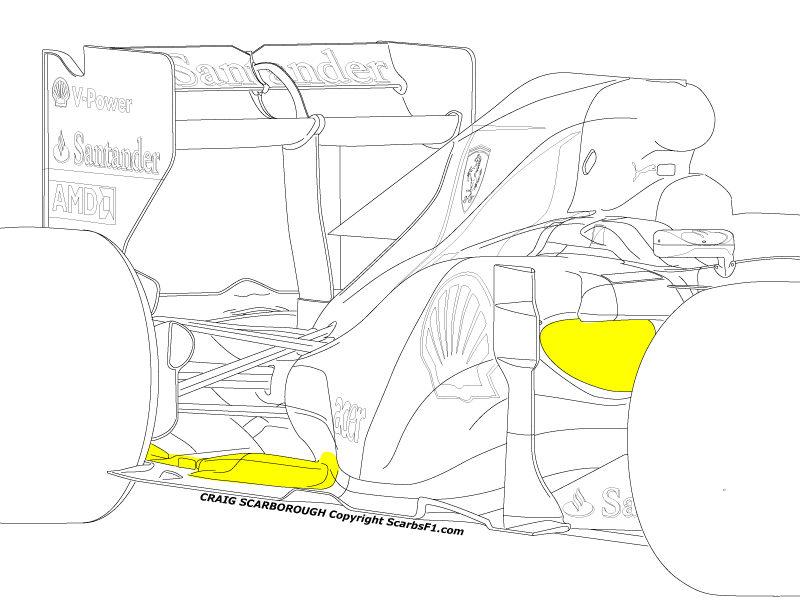 Another approach to regain lost downforce was the re-invention in 2010 of the exhaust blown diffuser (EBD). This used high energy exhaust gasses to blow the diffuser, the faster throughput of flow under the floor increased downforce. Two methods of EBDs were used in 2010, one blowing over the diffuser and the second blowing inside the diffuser. This latter solution was more effective at driving flow through the diffuser and created more downforce. However this necessitated a hole made into the diffuser to allow the exhaust gas to enter, I‘ve termed this method an ‘open fronted diffuser‘. A by product of the 2011 rules intended to ban the DDD, also stopped this open fronted diffuser solution. However the rules enforced the continuous surface only across a 90cm width of floor and the diffuser is allowed to be 100cm wide. 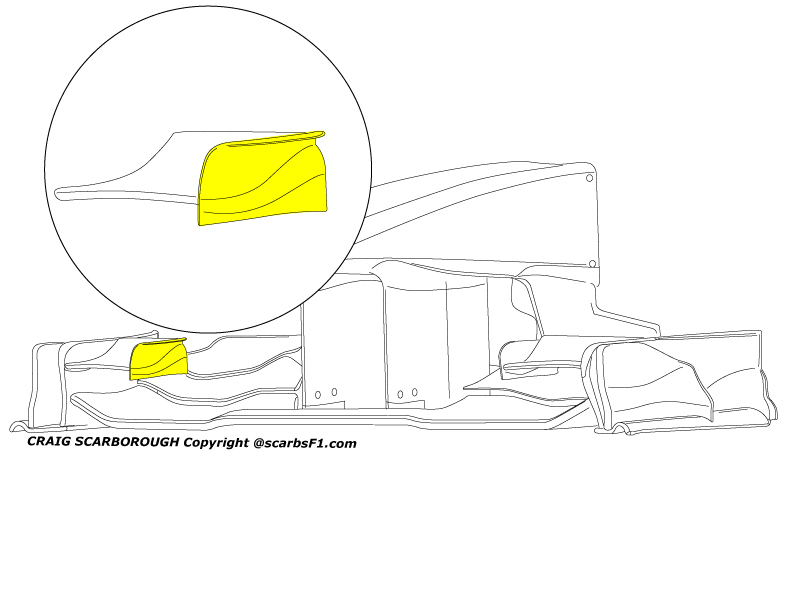 Thus a 5cm window was allowed each side of the diffuser. Red Bull and Ferrari appear to have found this loophole simultaneously. Recently Sam Michael pointed out this was probably the most efficient way to blow the diffuser under the new rules. As Red Bull appeared with this set up first, its often termed the Red Bull Blown diffuser. What these teams have done is to open up the floor 5cm either side of the diffuser, then route the exhaust towards this opening. The exhaust gas gets collected by the coved section of floor and this directs the high energy gasses under the diffuser, to recover some of the losses from the more open diffuser allowed last year. Renault meanwhile turned the problem on its head. As the aim of the EBD is to increase flow under the car, they pointed their exhaust at the front of the floor. 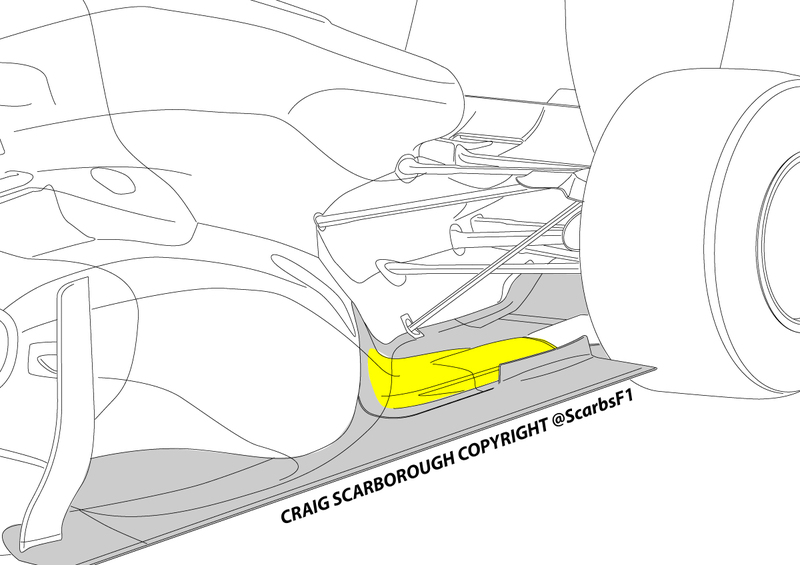 I’ve had it confirmed to me by two ex-Renault sources that the exhaust does indeed mainly flow under the floor. The exhaust pipe outlet sits above the step plane just ahead of the leading edge of the floor. This is not simply blowing out horizontally and across the floor, but is ducted slightly to blow downwards and backwards, this is roughly in line the with the flow trailing off the “V” shape above the splitter. 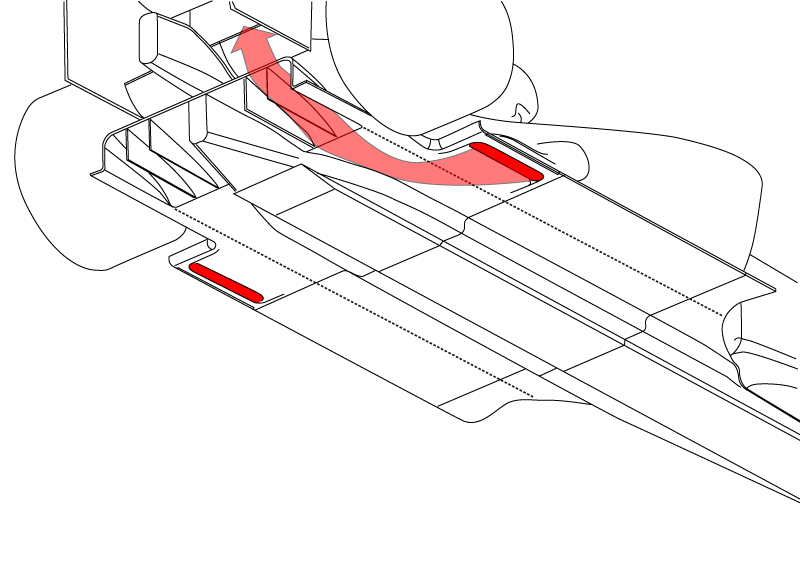 Along with the strong vortices set up by the splitter, vanes and bargeboards, this makes the floor appear wider than it is. The flow will go out beyond the floor and then curl back in and under the floor. Some flow will inevitably pass over the floor, but the most of the energy will be driving more flow under the floor to the diffuser. 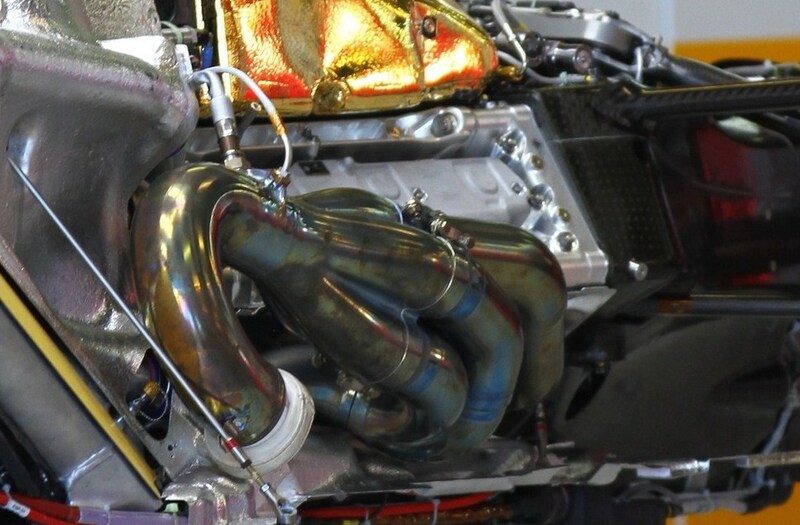 No conversation about exhausts this year, would be complete without some speculation about McLaren. Amongst the several exhaust systems run by McLaren over the pre-season tests was a “slit” exhaust. This appeared at the first Barcelona test, but did not seem to appear for the second Cataluña test. 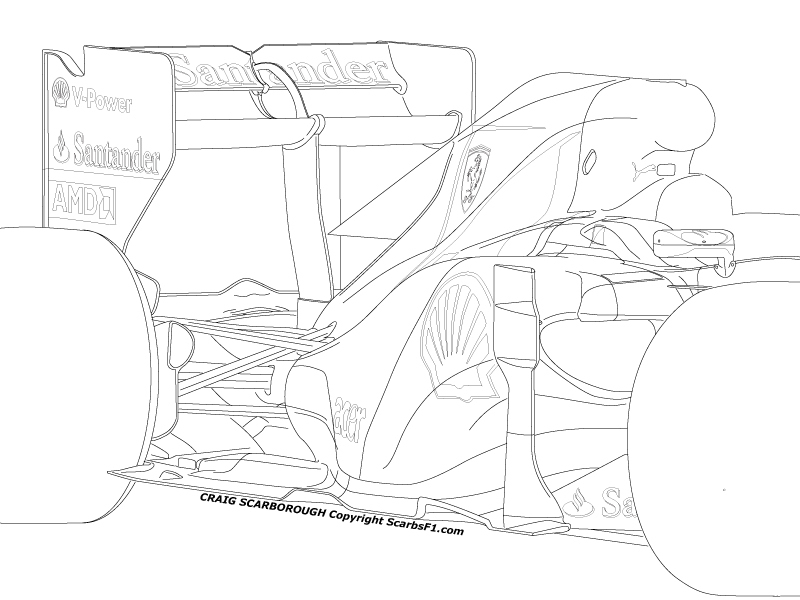 The exhaust collector could be seen to duct towards a double thickness section of floor ahead of the rear wheels. 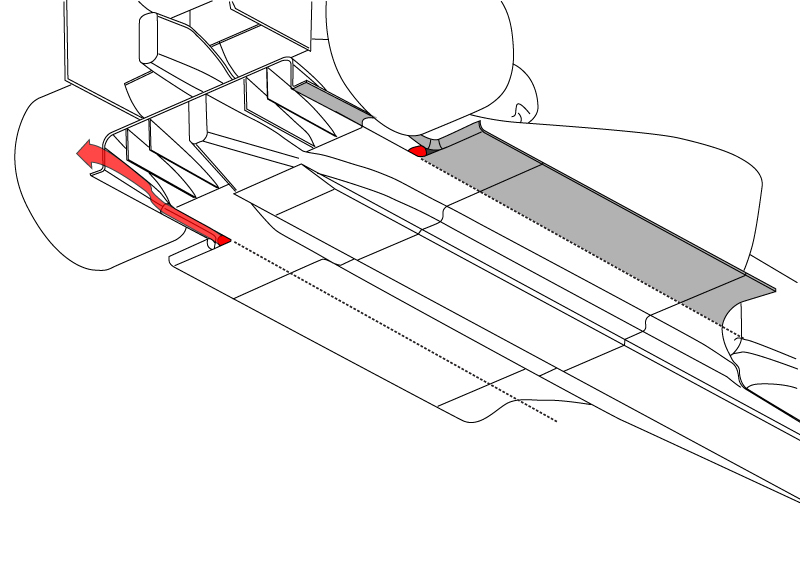 This section was also interesting for its longitudinal slot, this slot was not large enough to be the actual exhaust outlet, This might be a cooling slot, or to improve the flow from above to beneath the floor. I beleive the Exhaust is actually below the floor. 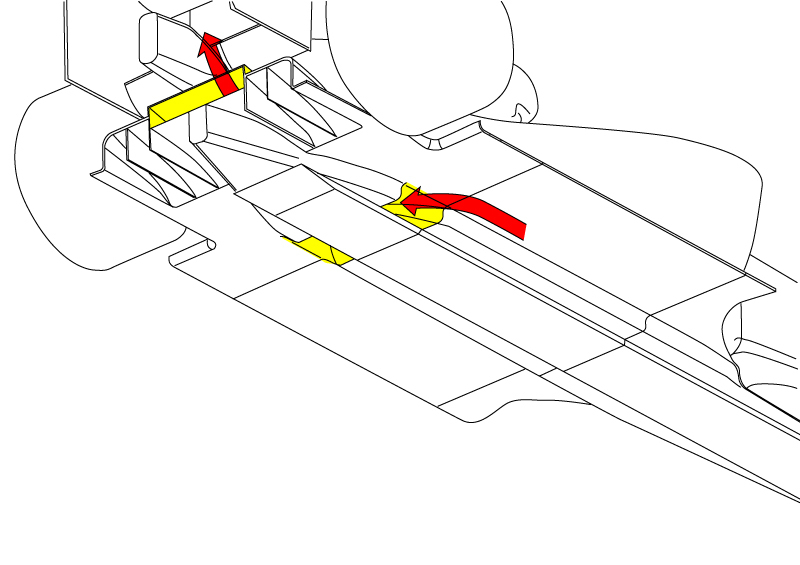 As when the car ran the same floor with a conventional exhaust outlet, there appeared to be a removable section of floor ahead of the rear wheels. Being just outside of the 90mm opening rule, the floor ‘could’ be opened to allow an exhaust to blow through to underneath. If sculpted correctly, the exhaust could be ducted back inboard and blow towards the diffuser from under the floor. It’s possible that this could be in interpretation of a legal opening, assuming it met the maximum fillet radius rules. I’d expect the resulting exhaust outlets to be a long wide slot, this wider outlet would be needed to meet the maximum radius rules and also reduce the back pressure from the tight curve of the exhaust outlet. As the exhaust would have a tortuous bend, to curl back under itself to direct the flow inboard, rather than out wide around the rear tyre. For the final test at Barcelona, Ferrari brought the long awaited revisions to the F150 (although the cars name has frequently changed, I’ll continue to use this title). This consisted of a revised wings, new sidepods and new exhausts. It was Ferraris assertion at its launch that the car would have evolved aero and specifically different exhausts before the first race. So despite some people suggesting the changes are copying their rivals, it’s more likely that different teams have converged on the same ideas. 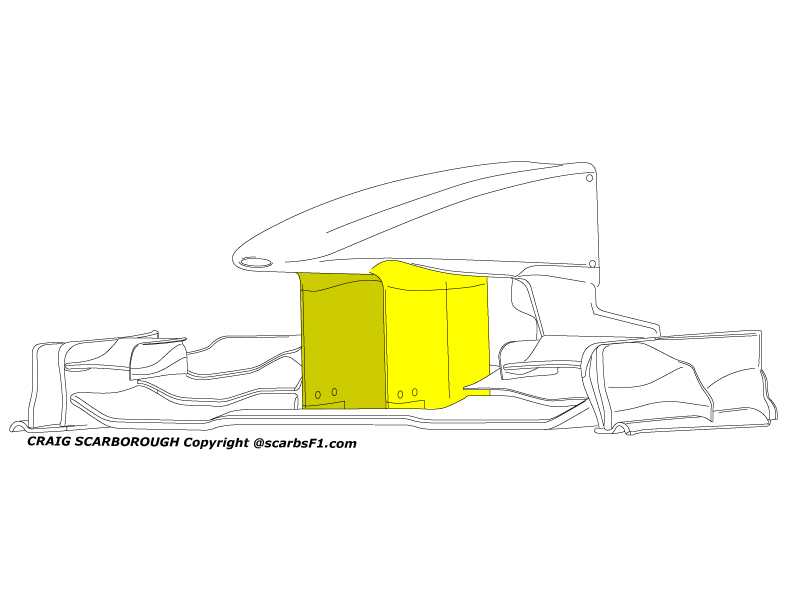 At the front the main changes are to the front wing and its supporting pylons. These pylons have been extended in a similar manner to Renaults ideas from 2009-2010. Since 2009 the rules on vanes and bargeboards around the front of the car have been severely restricted. The rules mandate a limit on the cross sectional area for the front wing mounts, Ferrari have therefore extended their wing mounts, but also narrowed them. Thus meeting the rules and still providing the car with some aero advantage. 3.7.2 Any horizontal section taken through bodywork located forward of a point lying 450mm forward of the front wheel centre line, less than 250mm from the car centre line, and between 125mm and 200mm above the reference plane, may only contain two closed symmetrical sections with a maximum total area of 5000mm2. The thickness of each section may not exceed 25mm when measured perpendicular to the car centre line. Details of the front wing have also changed, in particular the endplates, these now feature a more sculpted vane on the footplate. As well as the endplate fro the main front wing, the inner endplate for the small cascade mounted to it is also now shapelier. 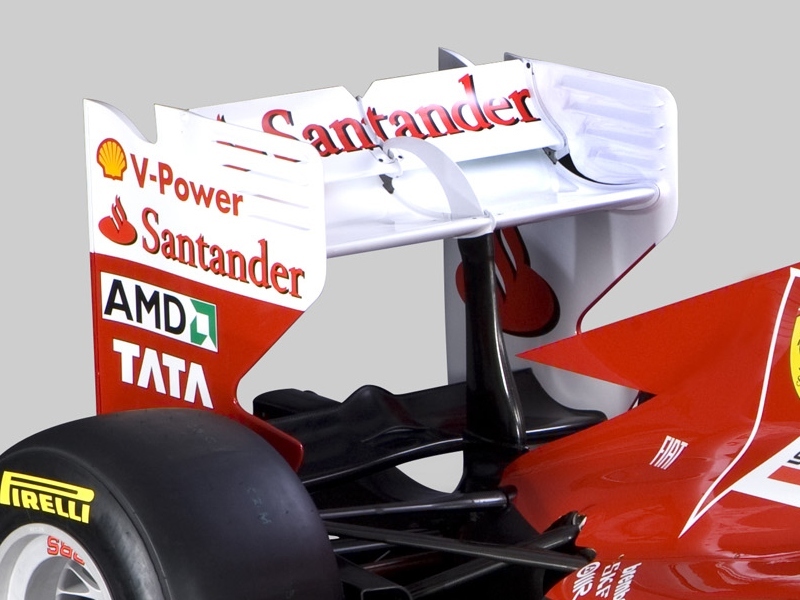 The small endplate now having a distinctly flared shape, aimed at redirecting flow inside the front wing. 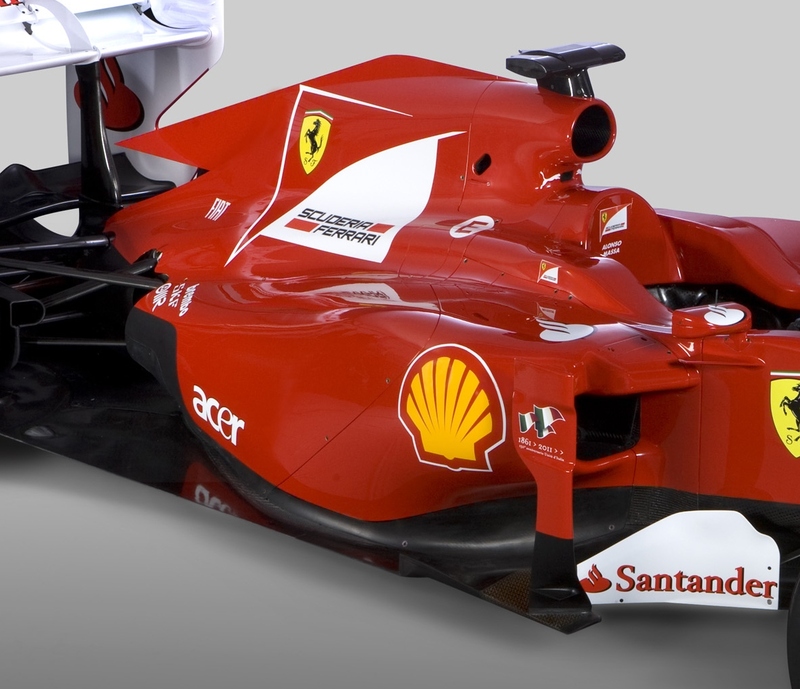 Along the middle section of car, Ferrari have produced a new sidepod, initially similar to the launch specification. But the main radiator inlet is now reshaped, being much more of a “U” shape and smaller with it. The sidepod inlet retains the distinctive protruding upper lip. I was told by Nick Tombasis that this was an aero feature and not a structural one (i.e. side impact crash protection). Curiously this lip features a removable panel to allow for cooling. Being so far forward of the radiators its hard to understand how heated radiator flow could be ducted into the small exit, or perhaps some electronics of KERS components are sited within this hollow section. Further back along the sidepods, the new exhaust system is routed along the floor and into an open section of floor in the outboard 5cm section of diffuser. 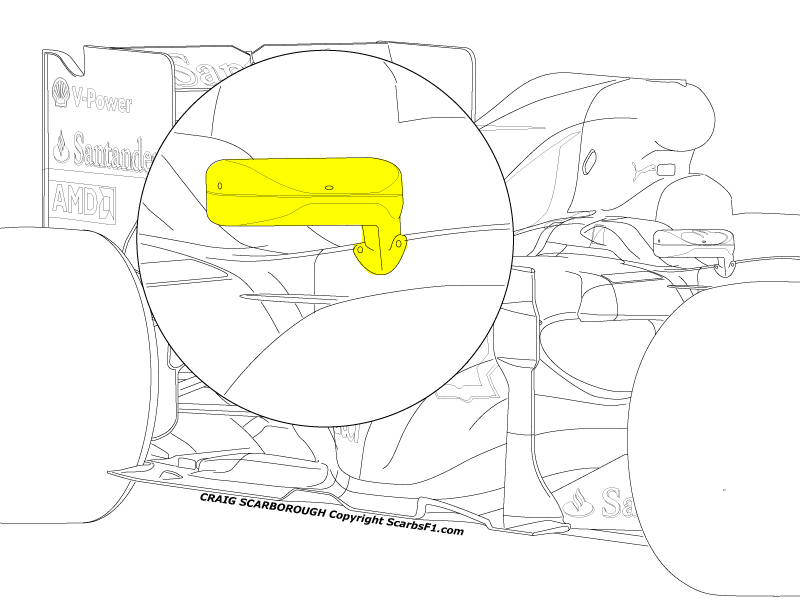 This is the same solution as Red Bull has come up with, as already explained this was an obvious area in the 2011 rules for exploitation, as I even proposed this location in my pre-season trends and solutions article. Ferrari route the flattened exhaust inside heat shielding along the floor. 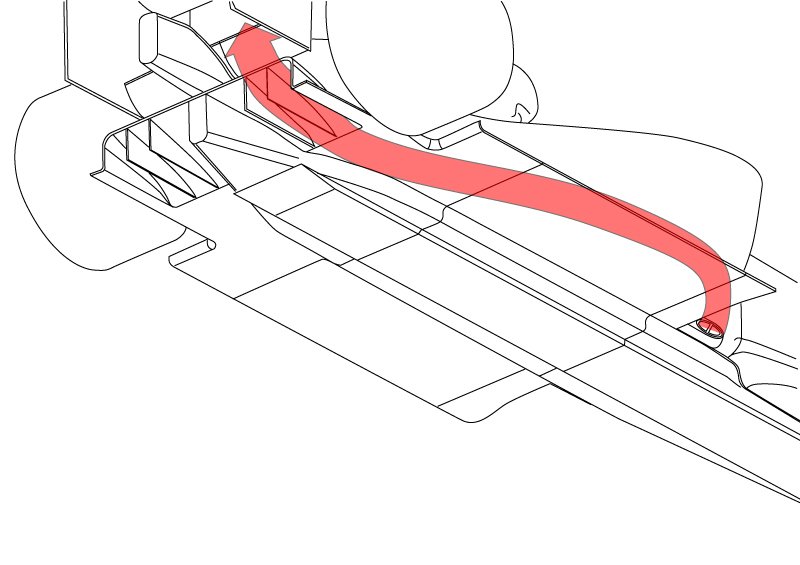 The blowing effect of the exhaust passes under the floor for a more effective method of blowing the diffuser. Ferrari wanted to produce the exhaust in glass ceramic composite (such as Pyrosic), but this request was denied by Charlie whiting who clarified the exhaust must be made of materials on the permitted materials list. Such composites, while allowed to be used in some exceptions, are not allowed to be the actual material of the exhaust pipe. Also the middle of the car gained revised wing mirror pods. these appear to be split into upper and lower mouldings. Presumably to allow sensors or electronics to be fitted inside the pods during testing or free practice. Lastly the rear wing has also been modified with a smaller flap. 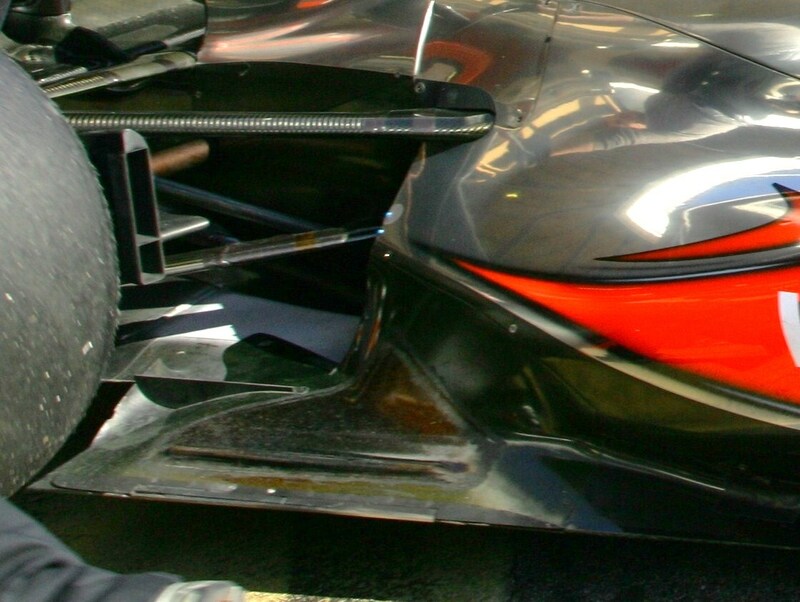 Several teams have switched their rear wing to smaller flaps, at first this is counter intuitive to the exploitation of the Drag reduction system (DRS) also termed the adjustable rear wing. As one would initially deduce that adjusting a larger flap would reduce drag by a greater amount. 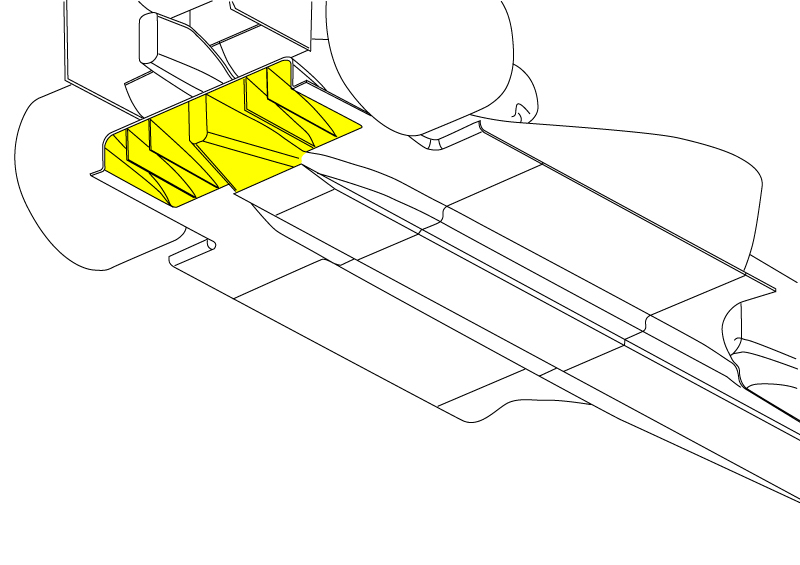 However, shallower flaps effectively flatten out when the leading edge is moved 50mm from the trailing edge of the main plane (50mm is the maximum slot gap allowed for the DRS). Thus they produce very little load and therefore little drag. Ferrari are amongst many teams that have placed their exhausts down low close the cars centreline. In doing this they are passing some of the exhaust gas through the starter motor hole in the diffuser to create more downforce. This solution was likely given the cars exhaust and diffuser layout, but was proven when Felipe Massa’s fire on the third day of testing showed the flames passing not only over, but also through diffuser via the starter hole. Given the rule changes this year, this solution is surprisingly legal. Teams were using this legal opening in the diffuser last year for aiding their double diffusers. Using the opening as an extra slot to make the diffuser more aggressive, just as rear wings use more slots to allow them more angle-of-attack. 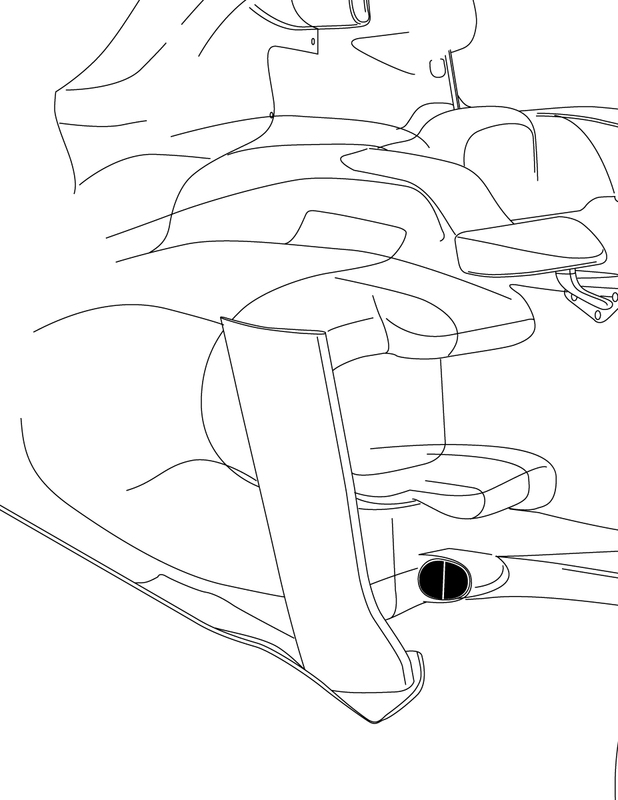 Mid season in 2010 the FIA issued a clarification to reduce the size of the slot. This formally made it into the technical regulations for 2011 as article 3.12.7. 3.12.7 An aperture for the purpose of allowing access for the device referred to in Article 5.16 is permitted in this surface. However, no such aperture may have an area greater than 3500mm2 when projected onto the surface itself and no point on the aperture may be more than 100mm from any other point on the aperture. It doesn’t state or prohibit what else the aperture can be used for, just its maximum surface area and width can be. A rectangular slot would be 10cm wide and 3.5 cm tall, a simple round hole would be a 66mm in diameter. As the FIA moved to prevent double diffuser, the loophole allowing opening the floor was also closed to the kind of open fronted diffuser as used by Red bull and latterly many of the top teams. With this change in the rules teams are limited in how they can blow the exhaust into the diffuser. Aside from Red Bulls exploitation of the outer 5cm of floor, the only other option is to blow some of the gas through the starter motor hole. By pointing the exhausts along the sides of the gearbox the fast moving gas flow will pass over the top of the diffuser, when it hits the trailing edge and gurney flap it will help draw more flow underneath the diffuser. Ferrari launched their F150 today in Maranello. While the car sports some interesting features, overall it must be seen as a conventional and literal approach to the new rules and carries the influence of the team’s two previous cars. This approach seems to suit Ferrari who has not worked well with extreme innovation in the past. They keep the car simple and gain the most potential from it. We can expect more extreme concept cars from several teams next week. 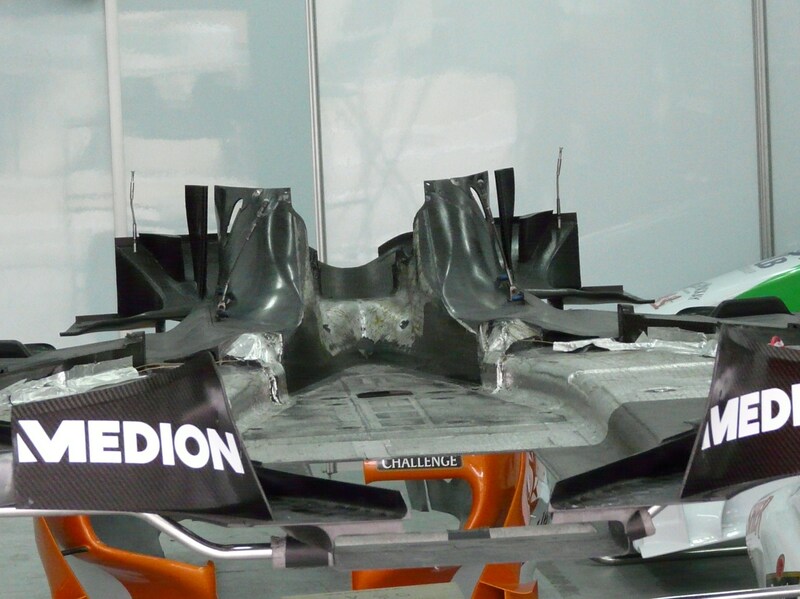 Firstly the front wing is last years; it even has the driver adjustable mechanism which is no longer allowed in 2011. However the nose cone will be fairly definitive, as it needs to match the front of the chassis and being a homologated part, cannot be structurally changed during the season. This front wing may be on the car for the opening test runs, but we will soon see an interim 2011 wing before a final version appears for Bahrain. One by-product of the new rules restricting front chassis height is that a V-nose might not be desirable. As the height of the dash and front bulkheads are limited to a maximum height, the “V” nose might be inefficient. V-noses allowed more flow under the car without putting too much heavy structure high up. Now to maximise space under the nose we might see a return to the simpler rectangular chassis cross section, with the top edge at the 670mm limit, which creates the most space underneath. Thus the Ferrari has a near flat top and the line from the cockpit opening rises up 45mm from the dash to the front wheels. The section of chassis attaching the suspension (subjectively) appears to longer. Access hatches on the top of the chassis allow access to the pedals, heave spring and GPS aerial. Otherwise the front wishbone arrangement appears conventional, with the steering rack placed lower than the upper wishbone for better CofG and steering arm geometry. Aero around the front end is largely carried over from 2010, with vanes hanging from the nose cone then larger bargeboards and pod wings mounted ahead of the sidepods. We can expect these to change in detail before Bahrain, Relatively simple mirrors are fitted and mated to a fin\vortex generator below. Similarly the roll hoop is a simple design, not as undercut as others. The sidepods themselves are an evolution of ideas from the past two years. The inlets have been made into a more distinct sideways “U” shape and the distinctive peak above the inlet is still there. This peak is now allied to a small removable panel, what this is for is not clear. As it appears the radiators are further back down the sidepod, following the same line as the break in the forward and rear section of sidepod bodywork. The panel might be for a cooling outlet, but perhaps for smaller oil\KERS coolers mounted alone in this area. The revised sidepod inlet creates a more aggressive undercut, although the sidepod has to be relatively wide (between the Shell and Acer logo) for the radiators to fit between the fuel tank and bodywork. Sidepods then sweep into a coke bottle shape with a generous hot air outlet at its tail, this rounded rear sectionalso hides the exhausts that blow over the diffuser. Rather than poking out of the end of the sidepods, the exhaust is slash cut to exit through the side of the bodywork. Aldo Costa hinted that the Exhaust and Rear Wing are areas for development between now and Bahrain. The top body no longer sports a shark fin; a simple upstand is used in its place, although no doubt the fin may return in testing. As was raced last year the bodywork either side of the fin opens up to allow cooling. At the back the rear wing is a new departure for Ferrari, the entire wing is mounted to the central pylon, and then the beam wing spans the endplates and sits fully expose din the airflow. It’s been Ferrari practice to split the beam wing either side of the crash structure for many years. The top rear wing is new, with the mechanism to allow the wing to open the slot up apparently inside the wings supporting pylon. The curved bracket protruding from the pylon moves up and down, probably by hydraulics fed up from the gearbox, to alter the wings flap position. Its possible to see the how the flap pivots via pins set into the flap trailing edge. A distinct “V” has been cut into the flaps trailing edge, probably to reduce its effective geometry, as it sits in airflow obstructed by the engine cover and wing adjusting mechanism. 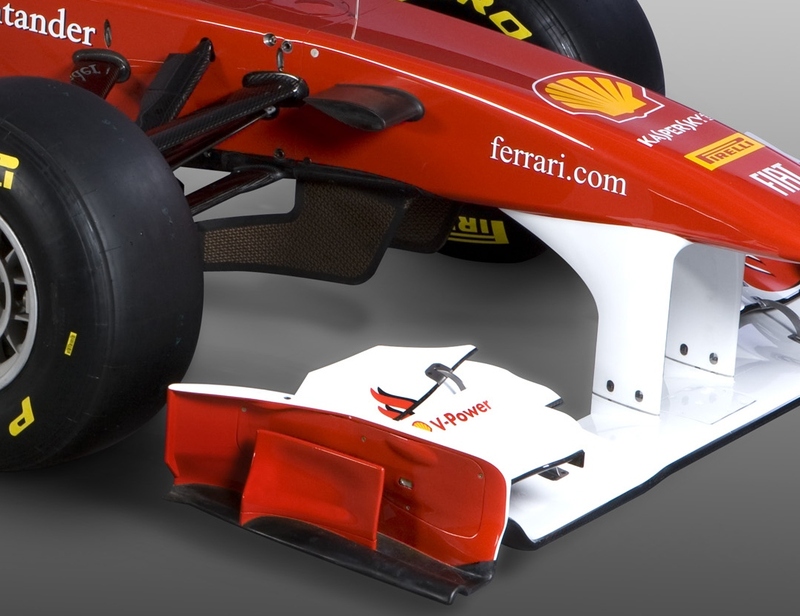 With very few detailed of the diffuser, it appears its a very simple diffuser which echoes the single decker design Ferrari first raced with in 2009. No doubt the gurney, inner fences and boat tail will alter as the team gets more performance from the diffuser. Being careful not to read too much into the cars launch specification the front wheels appear to be based on the 2010 vaned versions. New rules specify a maximum surface area for spokes and other similar parts of the wheel. Perhaps the narrow spokes make up for the surface area taken up by the vanes. One item raised by Ferrari was their innovative suspension system, not the pull rod system that many expected, as the car boasts push rods at both ends. 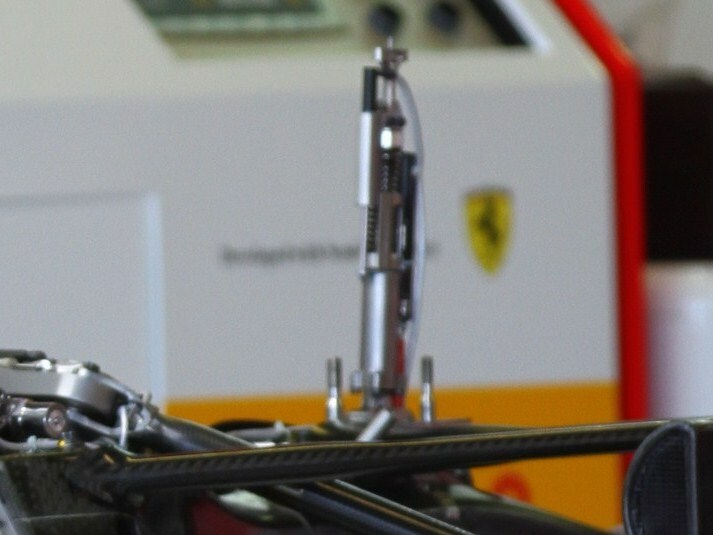 But Ferrari were rumoured around the pit lane to have run an interconnected suspension system last year. The front and rear suspension being linked to control the cars attitude. This could either be to control pitch (the nose rising or lowering through acceleration/braking) or warp (a mix of pitch and roll). Apparently used by Toyota and Williams without success in the past, this passive system could aid aerodynamics by keeping the underfloor in the correct attitude relative the track. However the front and rear suspensions may be interlinked, the rear suspension is certainly well packaged. Without the large lumps in the rear bodywork, Ferrari have clearly designed the various rockers, dampers and springs into a much smaller space. They appear to be positioned close to the front of the gearbox, as there is a dead area above the clutch and gear cluster, that is usually unoccupied. this set up sees the pushrods reaching forwards to operate the rockers. Renault adopted this approach last year. This set up is eased by the deletion of the rear torsion bars, so Ferrari have probably followed the increasingly common route of no rear side springs, instead the rear is supported solely by the third spring in heave or the antiroll bar in roll. 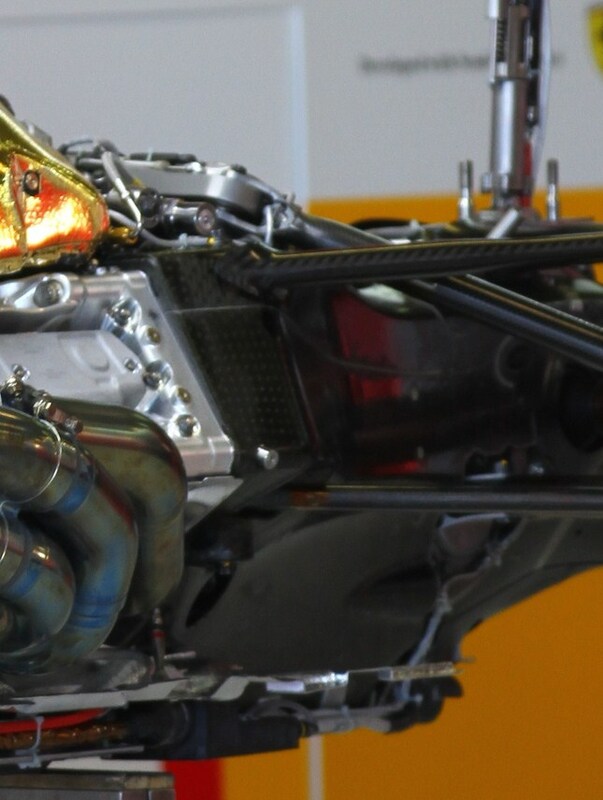 As double diffusers are banned the advantage to inclining the engine and gearbox by 3-degrees is lost now, so we can expect the engine is again mounted horizontal. With engines frozen, the only changes are reliability alterations (with the FIA’s permission) or changes to accommodate KERS. 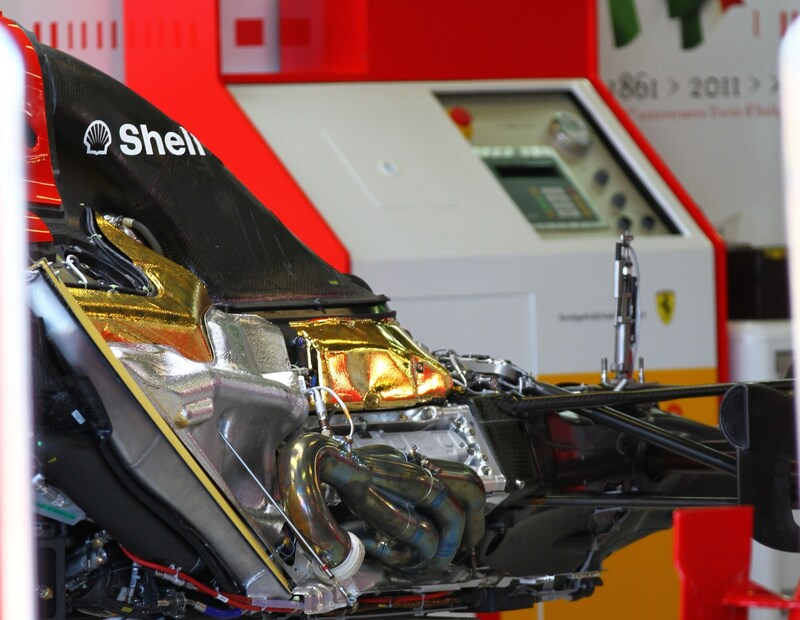 Ferraris engine man Luca Marmorini announced more changes to the engines pneumatic valve system (PVRS). This area was changed after reliability problems last year in the early races. Marmorini, who came back to Ferrari from Toyota, is thought to have brought ideas for a more efficient PVRS system with him. Worth not only reliability, but a increase in performance through lower friction and less engine degradation over the course its 3-4 races. The KERS system places the MGU offset from the front of the crank and attached to the oil tank, as the unit is cooled by the engines oil. The oil tank is quite large and Ferrari are suggested to also run another tank above the clutch within the gearbox. The KERS battery pack is mounted inside the monocoque under the fuel tank (not within the actual tank and petrol!). As the batteries are denser than fuel this keeps a low CofG, already most teams have several centimeters of space under the fuel taken up by blocks of ballast, rising the fuel tank by an equal amount. One area Ferrari were clear that they have improved KERS on this year is the way the MGU charges when the car brakes. Marmorini stated this was improving the “dragging” of the system. 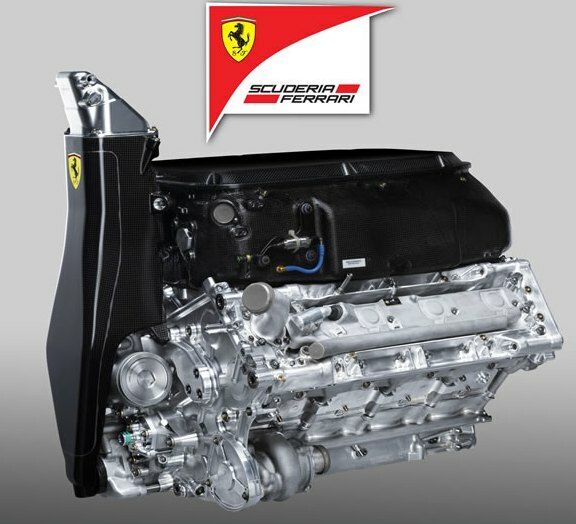 Little word has been made on the gearbox, Ferrari have adopted a titanium skeleton with bonded on carbon fibre panels for several years. Aside from the packaging of the pushrod suspension, this is expected to be largely carried over this year.